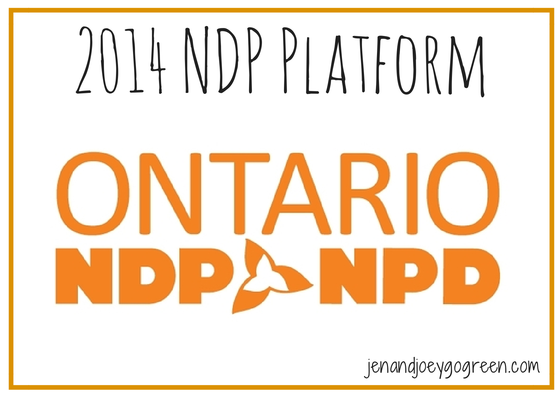 I really like the layout of the NDP platform because it makes it easy to see what they plan to do and by when. 3 years ago I reviewed their plan and talked to several candidates running in ridings across the province. Back then their plan was much more comprehensive than it is for this election. I have reviewed their plan for their commitments to environment, transportation, energy, food, health care and education. The NDP has general plans to protect the environment with the focus on waste. They want to push the cost of recycling and safe disposal of toxic materials back onto the companies that produce them. This is already in place in Ontario for several industries so it is not clear which industry they are targeting.They also would like to reduce waste by ensuring it isn’t created in the first place. Their plan to achieve this is my strengthening regulations that focus on consumer packaging. Conduct an Environmental Assessment of pipeline projects that impact our communities, including an investment of $2 million annually (this is already a legal requirement so I am not sure what they are planning to do beyond the regulations). Protect the Great Lakes with an action plan to control invasive species. There are several key transit projects that the NDP plan to prioritize,including the all day two-way GO Train to Kitchener and Niagara Falls, the Downtown Relief Life, Scarborough transit and Clean Trains Now and Scarborough transit. On the Union-Pearson air-rail link. There was no food/agriculture section in the NDP plan. The NDP want to help families be able to install solar panels and make energy efficient retrofits to their homes. They will create a $50 million fun to cover loans for upgrades to heating systems, water heaters, low-flow toilets and shower heads. It will also be used to fun solar panel installations. For low income families, they plan to offer these loans with no interest. They want to launch a Student Achievement Program with the goal of helping kids succeed. This Program will start in 2016 with an annual investment of $35 million and will include hiring an additional 1000 Educational Assistants. The NDP will invest in several areas of health care including $65 million for mental health and addiction and $5 million annually for Children’s Treatment Centers. What do you think about the NDP Plan? Pros or cons? This year they have a little chart that shows how much they will save (through cuts) and then how much they will spend. But it is totals and doesn't show how it is allocated.